The following list of items has been compiled for your convenience. 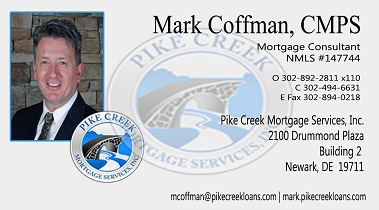 Please bring this information to your mortgage application in order to expedite the processing of your mortgage loan. To receive the complete contents of this special report titled "Checklist Of Items Lenders Need To Approve Your Loan Application" and get vip access to the rest of our FREE home loan success reports, simply fill out the form below and we will send you an INSTANT ACCESS link to the email address you provide below. Also, make sure you register for our Insider Mortgage Secrets, browse our HomeBuying Resources section and fill-out a free no-obligation secure online application or call our Newark, Delaware office at 302-494-6631 with any questions you have.